A beautiful heritage listed building that sits right beside the ocean pool at Kings Beach. Built in 1937, as part of a development scheme to make Kings Beach a premier holiday attraction. 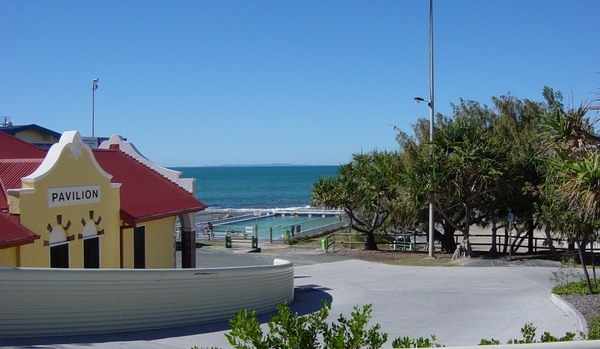 Queensland has a long tradition of establishing sea-side resorts. During the 1920s when public bathing in sea water became widely accepted, various councils became competitive in their quest for holiday makers. The design of these pavilions is influenced by a Mediterranean style of architecture, dissimilar in layout and form to the pavilion at Kings Beach, although some detailing such as the glazed brick columns and windows sills and heads are similar . At least four of these pavilions exist in 1994. According to the local press of the day, the dressing sheds were designed as to be an adornment to the beach. They were built of brick and plaster with a red roof, adding a touch of vivid colour to the already picturesque scene. The building contained a small kiosk, a small spare room to the rear of the kiosk, an entrance vestibule with ticket box and the open air toilet wings. For several years during the 1950s the Surf Life Saving Club were stationed in the pavilion while a new club house was built adjacent to the pavilion. The Surf Life Saving Nippers were housed in the building from 1971 until 1980 when the kiosk was re-opened. In 1977 a public pool was opened on the east side of the building on the beach front. Open from 6am every day the cafe offers fabulous coffee, home-style goodies, healthy smoothies and a lovely little corner for the kids!